I am becoming more and more convinced that coffee shops are the new mission frontier. I stopped at Beans ‘n’ Creme in Sun Prairie this morning for my usual fix (nothing fancy, just plain old coffee…) and I saw a group of men all with their Bibles open having a rather animated conversation. 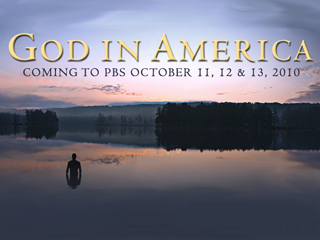 They were talking about the new PBS series, God in America, that premiered last night (and that I intended to plug on my blog BEFORE it aired, but I got busy and forgot…). This brought to mind the number of posters, emails, and invites I have seen the past two weeks for viewing parties. What is striking is that all the invitations I have seen or received have been from Lutherans, Catholics, ecumenical groups or campus ministries. Not one viewing party that I am aware of was United Methodist. I find this interesting and a little sad, because almost every other mainline church in our state has been promoting the series. Hmmm…..
I’ve had it. The system wins. The powers and principalities are stronger than my faith. I am done. I am leaving the ministry. At least the ordained ministry. I have got to get out of this rotten system so that I can actually serve God and do God’s will. I took your article (Make-No-Wave) to my church council to talk about “those” churches dying of low expectations and no vision and apathy and complacency and how glad I am that we aren’t one of those churches. And you know what they said? They don’t want to be pushed. They do just want to be loved. They really don’t care what is happening in the rest of the world. The rest of the world is what they are trying to escape by coming to church. They hate it when I “make them feel guilty” that they aren’t doing more. They put up with me. They tolerate all my “motivational clap-trap,” as one council member so kindly put it, because they know they don’t have to do anything they don’t want to, so they can ignore it. One person did say that it was fine for me to do these ministries, and that if others wanted to do them that was fine, but they resented me trying to impose my standards and expectations on them. I can’t do this anymore. I’m not blaming you. Your article didn’t make this happen. It just uncovered what I have been in denial about for a long, long time. The church is dead but just hasn’t had the good grace to lie down. It stinks to high heaven, but we pretend it’s roses instead of naming what it really is. $#!&. I am totally fed up trying to talk people into wanting to be Christian. I cannot believe this is what God called me to. Categories: Church Leadership, Core Values, Personal Reflection, Religion in the U.S.
We’ve been teaching and committing ourselves for two days now to live out the spirit of early Methodism at the Wesleyan Leadership Conference 2010– about equal numbers lay and clergy, sixty three registered and a few others beside. The message is getting out– and can get out more. You can read the highlights of the presentations on Twitter under the hashtag #WesleyLC2010. I heard Rob Bell at Duke Div.’s Convocation two weeks ago say this: “You thought you joined a revolution only to find that you are being asked to run a religious organization.” There’s the problem we face all the time, isn’t it? I praise God that our pastor challenges us to grow in grace and make waves. I am 64 years old — too old to be part of an organization that only wants to play church!! I don’t have too many years left and I want to grow in my faith, understanding, obedience, and holiness so that when I get promoted to the Kingdom I look like I belong there. Keep encouraging pastors to challenge their church families to grow in grace. That is what keeps us living and growing ever closer to our wondrous Lord!